Twenty ships of Vice Admiral Hosogaya Boshiro's (former CO of MUTSU) Fifth Fleet, including light cruisers KISO and TAMA, three destroyers and four transports, carry the Adak-Attu and Kiska Occupation Forces to the Western Aleutians. Enroute, the Adak occupation is cancelled and the Adak-Attu Occupation Force is directed to seize only Attu. At 1500, Captain (later Rear Admiral) Ono Takeji’s (former CO of AS TAKASAKI) Kiska Occupation Force lands a battalion of Special Naval Landing Force troops at Reynard Cove on Kiska without opposition. 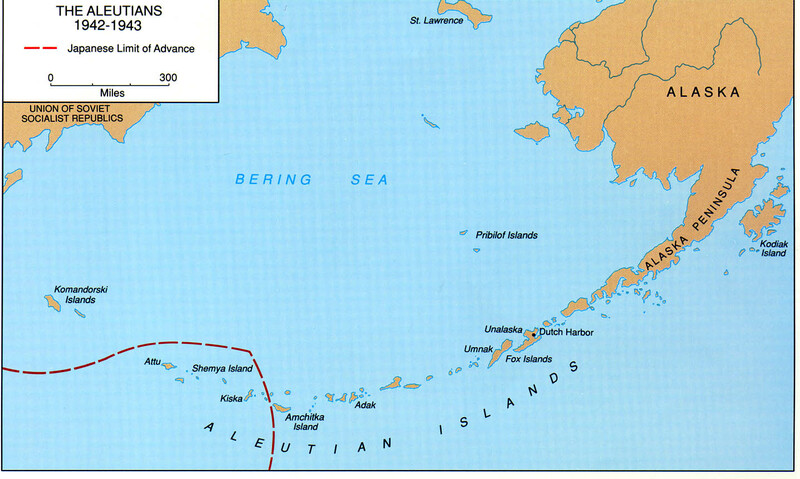 At 0300, Rear Admiral (later Vice Admiral) Omori Sentaro's (former CO of ISE) Adak-Attu Occupation Force lands a battalion of Army troops on Attu, also without opposition. The 11th Air Force strikes at Kiska Island for the first time. Five B-24 "Liberator"and five B-17 "Flying Fortress" bombers from Cold Bay load bombs at Umnak Island and hit Kiska harbor installations and shipping. Japanese AAA downs a B-24. The next day, six B-17s and one B-24 bomb Kiska. A warship is seen burning in the harbor. From this day on, the 11th Air Force continues almost daily strikes in an attempt to bomb the Japanese out of Kiska, The raids are interrupted only by weather. Captain (Vice Admiral, posthumously) Harada Kaku's seaplane/submarine tender CHIYODA departs Yokosuka for Kiska with troop transport ARGENTINA MARU (future KAIYO) escorted by DesDiv 18's ARARE, KASUMI and SHIRANUHI. CHIYODA carries Type A midget submarines HA-28, HA-29, HA-31, HA-32, HA-33 and HA-34, six Type 2 Nakajima A6M2-N “Rufe” seaplane fighters and Type 95 Kawanishi E8N “Dave” 2-seat reconnaissance floatplanes, the 150-man crew of the future midget submarine base, a detachment of the 12th Construction Batallion and 200-tons of cement. CHIYODA arrives at Kiska. The midget submarines are assigned to the 5th Guard Unit, Special Purpose Unit. This unit is the first Kiska midget detachment under Lt( j.g.) Otozaka Shoichi. Previously, Otozaka had been designated CO of the Kure Island (Midway) midget detachment. The 12th Construction Batallion detachment begins erecting a maintenance shed and four sets of launch rails in the west part of Kiska Harbor. That same day, LtCdr (MOH, posthumously) Howard W. Gilmore's USS GROWLER (SS-215) attacks the three destroyers anchored outside of the harbor. Gilmore sinks ARARE and damages SHIRANUHI and KASUMI. W of Sredni Point, Kiska. LtCdr (NC, posthumously) Mannert L. Abele‘s USS GRUNION (SS-216) attacks three warships he takes to be destroyers, but actually are subchasers CH-25, CH-26 and CH-27. Abele torpedoes and sinks CH-25 and CH-27 and possibly damages CH-26, all at 52-02N, 177-42E. Rear Admiral (later Vice Admiral) William W. Smith’s Task Group 8.6 shells Kiska damaging its incomplete installations and destroying one A6M2-N fighter. After the bombardment, three midget submarines are constantly stationed at a mooring buoy in the harbor. The midget submarine crews start training and diving exercises. LtCdr Tokutomi Toshisada's RO-61 arrives at Kiska and provides the midgets with electricity during her stay there. 11th Air Force B-24 and B-17 bombers escorted by P-38 "Lightning" and P-39 "Airacobra" fighters attack Kiska. Three midget submarines moored at the buoy in Kiska Harbor are strafed during the air attack, but the damage is minor. The submarine base off Kiska Harbor is completed. Three midget submarines are kept in a shed and three are moored at the buoy in the harbor. 11th Air Force B-24s raid shipping in the harbor. LtCdr Egi Shoichi's RO-65 is lost in a diving accident. Nine members of the 12th Construction Batallion die in a bomb shelter after a direct hit. During a heavy storm, HA-28 at the mooring buoy is swamped through her conning tower hatch and sinks. By the end of the year, midget submarines HA-31 and HA-33 become inoperable as a result of hull leaks and inadequate maintenance. Both are later repaired. LtCdr Watanabe Katsuji's submarine I-169 departs Kure, carrying a midget submarine, spare torpedoes and personnel of the second Kiska Midget detachment led by Ensign Majima. That same day, LtCdr Kobayshi Shigeo's submarine I-171 departs Kure, carrying a second submarine and the rest of the second Kiska Midget detachment. I-169 arrives and disembarks her cargo. I-171 arrives and disembarks her cargo. Two 11th Air Force B-25 “Mitchell” bombers conduct a low-level attack on Kiska. One member of the midget submarine base personnel is killed. I-169 departs Kiska for Yokosuka, carrying the pilots of the first Kiska Midget Detachment. A heavy storm catches the unmanned midget submarines HA-31 and HA-33 moored at the buoy. After their mooring lines snap, both midget submarines are stranded on a sand bank in shallow water, half-buried. Repair of HA-33 is deemed impossible. Kiska is attacked by 11th Air Force Curtiss P-40 “Warhawk” fighters from Amchitka. 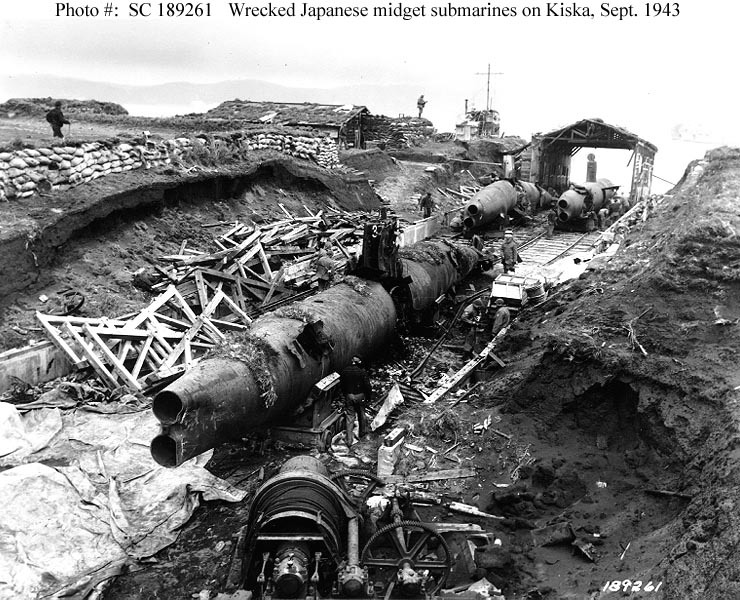 Midget submarines HA-29 and HA-34 receive serious damage. During the following days, HA-29 and HA-34 are cannibalized for spares to repair HA-32, but as a result of continuing air attacks and sand storms her repair cannot be completed. The new C-in-C, Fifth Fleet, Vice Admiral Kawase Shiro (former XO of KIRISHIMA) issues orders to evacuate the midget submarines to Attu to escape air raids. Rear Admiral (later Admiral) Thomas C. Kinkaid’s Task Force 16, covered by Rear Admiral Francis W. Rockwell’s Task Force 51, lands elements of the Army’s 4th and 7th Infantry Divisions under Maj Gen Eugene M. Landrum at Holtz and Massacre Bays that later capture the island. LtCdr Inoue Tadakane's I-31 and Cdr (Captain, posthumously) Irie Tatsushi's I-34 arrive at Kiska to evacuate the midget submarine crews. Soon after, a signal is received about the American landings on Attu. The fleet submarines embark midget submarine crews and technical personnel and depart the next day for Paramushiro, Kuriles. The Imperial General Headquarters decides to evacuate the garrison at Kiska. Cdr Inada Hiroshi's I-21 arrives at Kiska and embarks ten members of midget submarine base personnel, departing the next day. Two midget submarines in the harbor are blown up with demolition charges and one midget submarine is blown up using two Type 98 torpedo warheads. Three midget submarines in the maintenance shed (including HA-32 and HA-34) are also demolished. I-9, under Captain (Rear Admiral, posthumously) Fujii Akiyoshi, departs Paramushiro for Kiska to evacuate the personnel of the midget unit. Three days later, the submarine is detected and sunk by USS FRAZIER (DD-607). The maintenance shed and all surrounding installations are doused with gasoline and set afire. A total of 20 Type 98 torpedoes are dumped into the harbor. The last technical personnel are evacuated aboard light cruiser KISO. 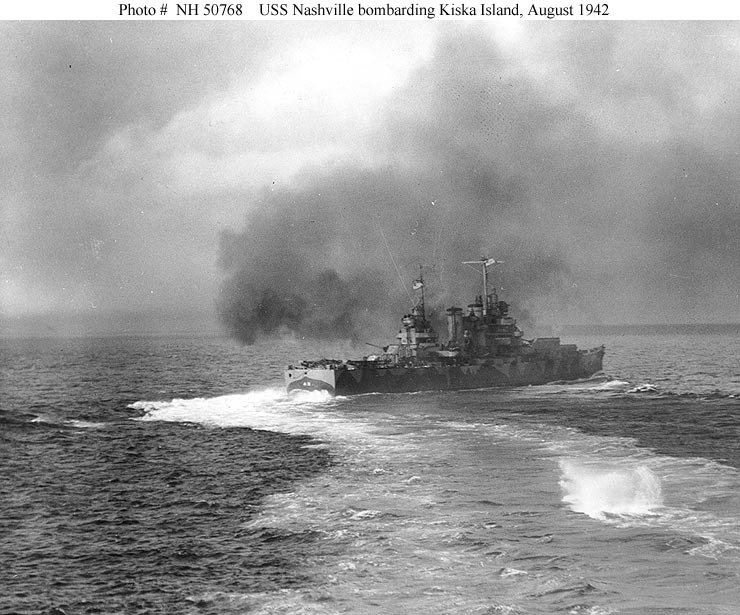 A task force under Vice Admiral Kinkaid lands U. S. Army and Canadian troops on Kiska. They find the island has been evacuated by the Japanese.